EARLY MORNING COOKS: Before dawn Sa﻿turday,﻿ locals begin making thousands of pounds of famous Alsatian sausage to be served on﻿ picnic day. Pictured below right are veteran wurst-tiers, who along with a crew of 50+ parishioners, will make sure the succulent sausage is just right before being stored in the giant walk-in cooler. Local "Castrovillians" can be seen scurrying all over the park during the day on Saturday preparing the grounds in anticipation of the big crowds from all over the state and beyond who will be joining the festivities Saturday night and all day Sunday. ﻿﻿SATURDAY 6:30 pm - 11:00 pm: MUSIC, FOOD AND ICE COLD BEER! Get a jump on the fun Saturday evening! For the 9th year, the Biergarten Party has opened Saturday evening with frosty cold beer on tap, hot dogs and live bands to keep you toe-tappin' and singin' along. The phrase "homecoming" certainly applies to this evening as extended family and friends meet to eat, drink and catch up. Even if your roots aren't Castrovillian, you are truly "family" at St. Louis Day! Tip #1: If you want to speak like a Castroville native, remember the surname Tschirhart is pronounced "Sheer-hart." The tasty Sarge’s St. Louie Red Hots (all-beef hot dogs with all the trimmings) are grilled to perfection by Sarge's descendents, Josh Keller & brothers, and go great with icy cold beverages. Tip #2: You'll want ALL the trimmings on yours! This is not a weekend to count calories. Later in the evening you'll want to take part in the annual Lighting of the Sacred Fire, when a mountain of cured mesquite wood will be touched off to provide red hot coals for the famous slow-roasted BBQ Brisket. Smoking and seasoning will be under the careful watch of Todd Haby & Travis Holzhaus, along with their veteran crew. St. Louis Day Boardwalk will also be open Saturday evening as well as Sunday with games & fun for the kids. Start your day in the majestic St. Louis Catholic Church for Holy Mass at 9:30 am. Archbishop Gustavo will preside. The famous Liederkranz Choir of San Antonio will once again be the choir for this beautiful Mass. Stay parked and hop on a shuttle to Koenig Park for the day. The air-conditioned buses will drop off and pick up all day long. Tip #3: this is the best way to get there even if not attending Mass. THE FAMOUS MEAL: For just $8 diners get a “piled high” 2-meat BBQ PLATE featuring smoked brisket and homemade Alsatian Sausage. Cured mesquite wood from area land is used to slow cook thousands of pounds of barbecued brisket each year. Enjoy homemade potato salad, cole slaw, bacon-flavored pinto beans, Haby’s Alsatian bread, pickles, onions and the savory St. Louis Day BBQ sauce. There’s plenty of ice cold tea to wash it all down. DESSERT: Leave a little room, as it will be hard to choose from so many homemade Cakes and Pies at the always-popular CAKE BOOTH! Favorite family recipes are lovingly baked and decorated by our parishioners. Buy a slice or the whole cake/pie to take home and enjoy later! ENTERTAINMENT: Multiple venues with more than about a dozen bands and dance groups will provide live entertainment Saturday night and all day on Sunday! GAMES: "And down the track they come!" can be heard throughout the day by veteran track announcer, Paul Jette at the 21st Annual St. Louis Downs “Horseracing” Booth. The Grand Futurity Race will crown another member to join the Wall of Fame. Visitors can “buy a horse” at the St. Louis Downs booth and take a chance at being named this year’s Grand Futurity Champion. Tip #4: They sell out fast, so get there early. St. Louis Day boasts one of Texas' best Horseshoe Pitching Tournaments. For the 44th straight year, the "Persyn Boys" will have the pits measured and manicured to near perfection in preparation for the day-long affair. 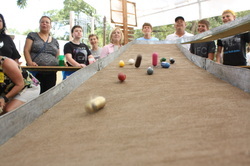 The Washer Pitch Tournaments will run all day long adjacent to the Horseshoe Pits. MEMORY LANE: Frank "Pancho" Mann, the “Voice at St. Louis Day,” will again keep visitors informed from the famous St. Louis Day Visitor Center for his 30th consecutive year (He co-chaired the BBQ operation for 20 years prior to that). Let him take you down memory lane, and be sure to sign the guest book. Like Pancho says, "In Castroville, St. Louis Day hangs on the calendar like Christmas." PRESS: St. Louis Day will be featured on various TV and radio shows. Times will be listed as they are finalized.